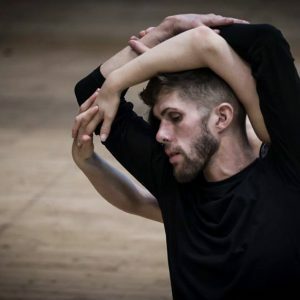 Taking a break from company work, 2015 marked the debut of Mike’s first steps as an emerging choreographer which resulted in his first professional solo being toured with remarkable success throughout the UK, including the Wales Dance Platform 2015, Edinburgh Fringe Festival and Cloud Dance Festival in London. His solo ‘4.33’, inspired by John Cage’s Silent score explored the numerical and anatomical features of the human spine. His work explores creating highly intricate, detailed and athletic choreography that pushes the body to its fullest capabilities and explores the beauty of the human body in its rawest form at a deeply personal level, honest and open to all. Mike is currently in the initial stages of researching his new solo, ‘BoxedIN’ after having a rewarding and explorative week as an Artist in Residence in March 2017 with National Dance Company Wales. Alongside his dance career, Mike is a keen Yogi, CrossFit athlete and regularly works as a Teaching Assistant in a variety of schools. 2017 also marks the beginning of his career as a Model.